They melt my heart ♥. On days like today when my anxiety is so high that it is just making me feel angry and the slightest thing is turning me in to a shouty mummy, I know I need to appreciate moments like this so much more. I have no car today, no plans and get to just enjoy these two by myself. For a few minutes I feel greatful for that but then the next I just want to run away. Why does anxiety like to make you just not appreciate anything you have or special moments? For the last week or so I have slept less than I did with a newborn. Oswin’s croupy cough has kept her and me awake pretty much all night and I am officially a zombie. If you spoke to me at all this week you would think I had taken something, it’s just not fun. So yesterday when I had the day with Oswin at home with Noah at nursery, I decided I was going to get all the washing done, sort my blog out, do the washing up mountain and then play with Oswin. Looking back at this I feel like saying “bless you” in a very condescending voice with a slight laugh. Honestly Noah is at nursery until 3:30, I managed to put one lot of nappies in the wash and make myself a tea… Then Oswin decided I had nothing better to do, so I was stuck under her asleep for 2 hours. If it wasn’t for the fact I hadn’t eaten and desperately needed a wee, I would have been OK! I eventually had to go and get Noah from nursery, thankfully it was so lovely and sunny that when we got home I could just let him play in the garden. I love seeing him ride up and down on his many (too many) bikes, cars and scooters. Oswin was desperate to get out so I put the blanket on the grass and gave them a snack each. I had the thought of, oo they are happy for a moment so I can get the washing out or reply to an email! But instead I picked my phone up and took the quick photo above. I then put my phone down and went and sat with my babies in the sun. This may seem like a normal thing to some people but I seem to struggle sometimes to appreciate playing and perfect moments with my little ones. This was definitely one of those. 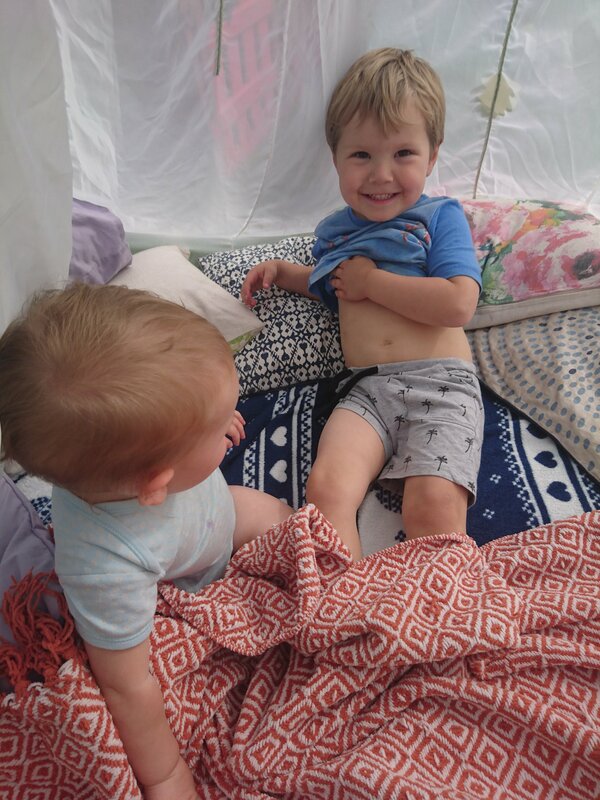 I definitely went to bed feeling warm and fuzzy last night knowing I didn’t let anything get in the way of a spontaneous picmic (Noah’s term) with my rapidly growing babies. Obviously it didn’t last as a ‘picture perfect’ moment as instantly Oswin decided to throw blackberries at me and use her plate as a steering wheel, Noah burst out laughing, nearly choked then joined in with the mini food fight. 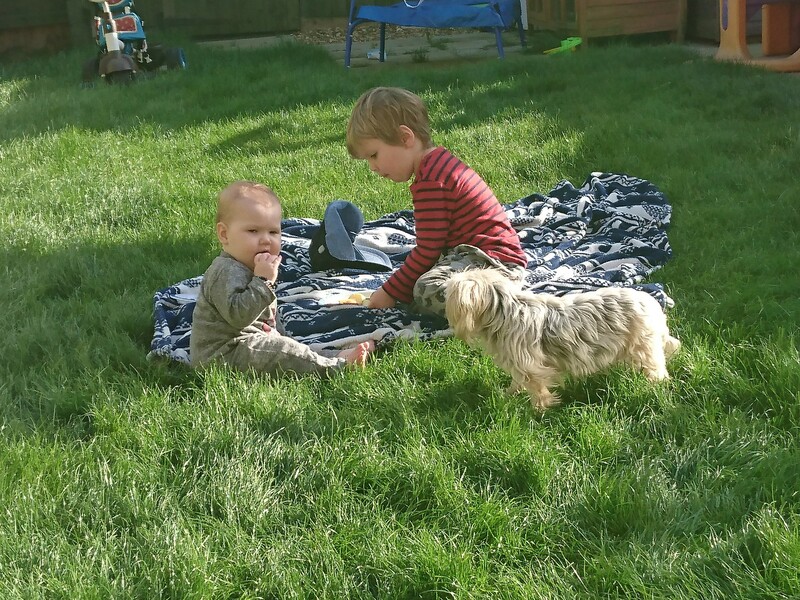 It was still a moment I will remember as spring arriving though, Oswin was able to crawl around the grass for the first time without getting wet knees and Noah said he needed sun Glasses.